Latinos in Finance has had quite an eventful and exciting year! This month, we will be taking a look back on all the exciting things that the organization has been up to this year. Reflecting the large diversity of the roles represented in our membership, Latinos in Finance hosted a wide variety of events that tackled issues and topics important to Latinos and trends in the finance industry. Two FinTech-related events were held this year: FinTech, The Future of Finance in March and How Demographics & Fintech Are Changing Investment Advice in September. July also saw The Benefits & Implications of Equity Crowdfunding, which encouraged investment in Latino entrepreneurs. Events focused on leadership in the workplace include Executive Presence in April, Directional Ambition & Owning Your Career in August, and Understanding Her: Partnering to Propel Millennial Women in October, with a special emphasis on encouraging Latinos to end the lack of representation in management roles. Personal finance events were also included in programming, such as Money Talks in June, Swiping Right for Your Financial Future in July, and Financial Planning EN ESPAÑOL in November. Additionally, specific to addressing issues that specifically affects the relationship between Latinos and the finance industry came Expanding Financial Inclusion: Creating Products with Quality, Dignity & Affordability in May. Of course, we can’t talk about LiF events without bringing up our flagship event - the 8th Annual Student Bootcamp. While each year is an even bigger success than the last, the 2016 Bootcamp was notable in that it also included 15 middle and high school students who bussed in all the way from Central Valley to attend the event as well as featuring DreamFunded CEO & founder Manny Fernandez. To read a complete recap, click here. The Mentorship Program, which in its inaugural year attracted over 50 students and mentors. They were matched and put into contact with one another in November, kickstarting the program. The goal of the Mentorship Program is to connect students with experienced professionals to mentor them and bridge the gap between university and entering the finance industry. The Professional Clothing Drive was for the benefit of the Dolores Shelter, which has a program specifically geared towards the rehabilitation of homeless Latino men in the San Francisco area. The clothing drive gathered items to help those men dress their best for job interviews. Of course, LiF also hosted near-monthly mixers to connect members in more casual settings, the most recent of which was the December 14th Holiday Party at La Barcha Restaurant. All in all, this was an exciting year of growth for Latinos in Finance. As a nonprofit entirely run by volunteers and donations, we would greatly appreciate your help in the growth of our organization and making a real impact on the finance industry as a whole. Please take a moment to look over our donation page - every cent goes towards putting on bigger and better events and community outreach! Perhaps the biggest changes that affect the direction of Latinos in Finance were the changes to the organizational structure. In an effort to expand its outreach and programs, the board of Latinos in Finance welcomed many new volunteers committed to the organization’s goals, in several cases creating new committees. All corporate sponsors of our events, including BlackRock, the main sponsor and host of our 8th Annual Bootcamp. Latinos in Finance is a nonprofit entirely run on donations and volunteers. The drive and commitment displayed by our volunteers keeps this organization afloat. We express the deepest gratitude for everyone who has aided us in realizing our mission. My name is Kathleen Velasquez and I’m currently a Research Analyst with ThirdAct PBC. As a member of the Communications Committee, I have written the Latinos in Finance newsletters since May of this year. My hobbies include traveling, swimming, and video games - that’s me in front of the Imperial Palace in Tokyo! I am originally from San Diego. While I love my hometown, it didn’t offer the professional development opportunities in the finance industry that I would have liked. I had some connections in the Bay Area due to graduating from the University of California, Santa Cruz with a BA in Economics so I relocated to the area earlier this year. 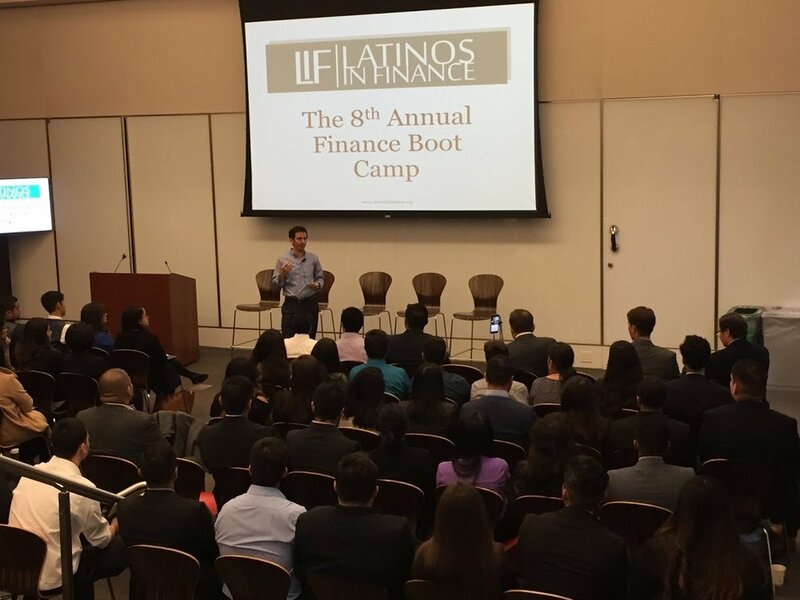 My first contact with Latinos in Finance was at the 2015 Student Bootcamp, where I met former President Kennie Blanco. Kennie offered me so much invaluable advice and from that point on, I decided to get more involved with the organization because I was very impressed with what a big difference a small nonprofit organization was making on the industry. Interestingly, I actually got my job from my current boss writing to me due to one of the newsletters. I am thankful that I got opportunities just from putting myself out there that I wouldn’t have had without Latinos in Finance. For the students reading this, breaking into finance is all about who you know. LiF provides an excellent opportunity for young Latino finance professionals to break in with the many networking opportunities. I strongly recommend that you get involved by attending our events, which is announced through email subscription, social media, and our website, the latter two of which I maintain myself. I strongly believe in Kennie’s message that you should hold the door open for others if they hold the door open for you. I am satisfied with the career path I am taking right now, but now I am perhaps even more driven to give back to the community that has been so welcoming and supportive, especially since there are barely any Latinas in my field! I am very fortunate to not only be surrounded by smart and successful people with accomplished careers, but also that those people are incredibly kind and driven to give back to their community. While there may be some elements of uncertainty in the New Year, I think the fantastic community is capable of continuing to do great work. I wish all of you a very Happy Holidays and a great New Year’s!